(Bloomberg) -- German stocks are developing a thick skin toward weak domestic macro data. Factory orders in Europe’s largest economy fell 4.2 percent in February, the worst monthly drop since January 2017 and significantly below analysts’ average estimate of a 0.3 percent increase. Yet, the DAX Index is up about 0.1 percent at midday, faring a bit better than some European markets, as the Stoxx 600 Europe Index declines 0.3 percent. 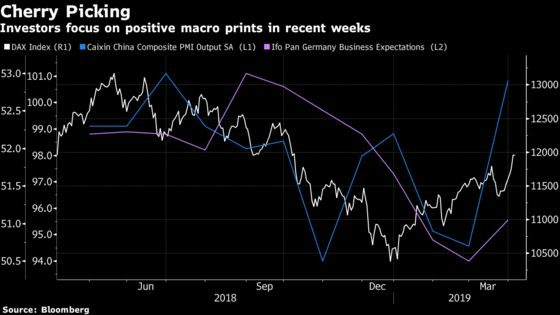 The DAX is up just over 13 percent this year, commensurate with a 15 percent gain for the wider gauge, as traders have taken comfort from reassuring macro data from China, while ignoring the grim picture for Germany’s manufacturing sector. Analysts at UBS are bullish on German equities, citing cheap relative valuation levels, while mentioning improvement in trade disputes and a turn in Chinese macro data. They also argue that the worst of downside economic surprises in the euro area may be over. “After 17 months of downgrades, German relative earnings momentum has turned,” analysts including Nick Nelson wrote on Thursday. Looking at the overall picture, the recent jump in China’s PMI is fostering bets on a rebound in fundamental data in the second half of the year. Important German car exports show some bottom-building, Ifo Institute business expectations gained last month for the first time since August 2018, and there is rising optimism about the success of a trade deal between the U.S. and China. “Right now, everyone is looking at the - hopefully - coming trade deal and the latest statements by the central banks continue to dominate markets. Hence a few bad macro data points aren’t spoiling the mood,” said Andre Koppers, portfolio manager at Oberbanscheidt & Cie.